Overview: Styled with elegance and charm, Nidhivan Hotels & Resorts in Vrindavan is the pioneer of luxury stay in the city. 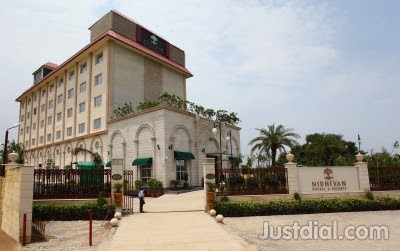 With a view to suit the taste and preferences of corporate travelers, vacationers, tourists and those on a pilgrimage in the holy city, the hotel offers a wide range of contemporary amenities and comforting facilities. Lavish interiors and stylish décor adorn the establishment making guests feel indulgent. Enjoy a pleasant and comfortable stay. Whereabouts: The hotel stands beautifully along Gopalgarh Tehra Road in Vrindavan at a distance of only 5 kilometers from Vrindavan Railway Station. The short distance of the property from the station makes it convenient for travelers to reach the hotel premises. It is well connected to major places of tourist attraction enabling one to explore the city with ease. The ISKCON group has an eminent temple complex situated at Raman Reti which is only 2 kilometers from the hotel and is worth visiting. Guests can avail the benefit of making online bookings at Nidhivan Hotel in Vrindavan by clicking on the 'Book Online' tab and enjoy a peaceful stay. Accommodation and Facilities: The hotel is well equipped and provides spacious banquet halls that serve to meet corporate and social needs of guests. Business travelers can conduct official meetings, conferences, seminars and other events at the banquet spaces provided by the hotel. It also makes for an ideal venue to host social gatherings, events, ceremonies, functions and parties on a grand scale. The spacious rooms are well appointed providing a warm luxurious stay. The rooms are centrally air-conditioned and comprise of amenities like LED television, multi utility work desk, minibar, tea/coffee maker, laptop size safe and internet access. One will enjoy a blissful stay in the tastefully furnished living spaces. Patrons can keep a check on their fitness by engaging in their daily workout session at the health center. The hotel alsooffers specially tours enabling one to explore the divine city. Restaurant: Tripti is the in-house restaurant at Hotel Nidhivan in Vrindavan that serves an array of delectable cuisines from across the globe. It is a purely vegetarian multi-cuisine restaurant where every dish is prepared using fresh and rich ingredients to retain the authenticity in the taste of food. One can also sip the wide variety of refreshing alcohol-free drinks that are served and enjoy their meal. Please scroll up for Nidhivan Hotel's address and contact details.